King Min Khaung Ra Za built Thattawra pagoda on the hill which is 50 feet high and one mile away from the palace site in AD 1525. 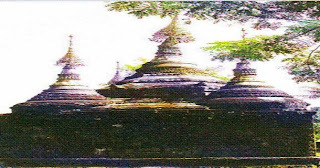 Eighty years ago, U Pha Taw renovated the pagoda because it fell into ruins. The base of the pagoda is in the form of substructure, and the upper part of the pagoda is in the form of conical pagoda. The pagoda is enclosed with the four small surrounding pagodas. The stone sculptural flowers, were sculpted at the whole cave.